today in Bangalore. What was quite amazing was the diversity of speakers in terms of their background/disciplines and the political establishment line-up for the inauguration (Veerappa Moily, Ananth Kumar, R Ashok and few others). Both of these only augur well for the biodiversity movement in the country. But a scan through the very poorly edited “Book of Abstracts” reveals (to my mind) the confusion among the contributors and editors as to what the congress means and should stand for. Apart from few good discussions I was able to have with people on open-data and making available data in public domain, a few new portals and hearing Ashish Kothari’s provocative plenary on Radical Ecological Democracy, the day was a mix of confused choice of talks packed into a day with hardly any time for discussions or questions – much like many poorly organized conferences that is a characteristic of our establishment. As usual, our political leaders who “graced the occasion with their presence in spite of their busy schedules” left after making few important observations in their speeches. In fact, I was told Ananth Kumar offered to help organize seminars for parliamentarians and lawmakers on biodiversity issues if any of the scientists/researchers offered to help. Commendable. I missed the talk by Veerappa Moily who also spoke and promised to forward the recommendations of the Congress to the Planning Commission. I saw no effort during the day though at trying to generate consensus or debate/discussion on building recommendations. I can only hazard sarcastic guesses as to how such recommendations will finally arise. In any case, if the editing of the abstract book is any clue to how the recommendations will be prepared, we can certainly forget anything meaningful in terms of process. Of course, that did not prevent me from taking the opportunity to report Anant Kumar’s tinted car for violation of tinted glass rule through BTP’s Facebook page. I have nothing against tinted glasses, but I thought a senior parliamentarian should cough up the fine that several others are being subjected to in a fairly efficient collection drive. On the other hand, there was no shortage of simplistic ones – One of the abstracts for example was from a study in a tiger reserve, where the researchers used a questionnaire to study improvement in knowledge of villagers who attended a session on community participation in forest management. This is terrible at so many counts: to be able to measure “knowledge improvement in community members” using a multiple-choice pre-post questionnaire, on the idea that a workshop on forest management could be a powerful instrument in participatory management itself and to imagine that such one-off initiatives could result in participatory processes. The first plenary session chaired by none other than Madhav Gadgil started 2.5 hours late thanks to our political leaders’ otherwise busy schedule. The audience mostly seemed to include students from all over the country with fewer more familiar people from wildlife/conservation circles. 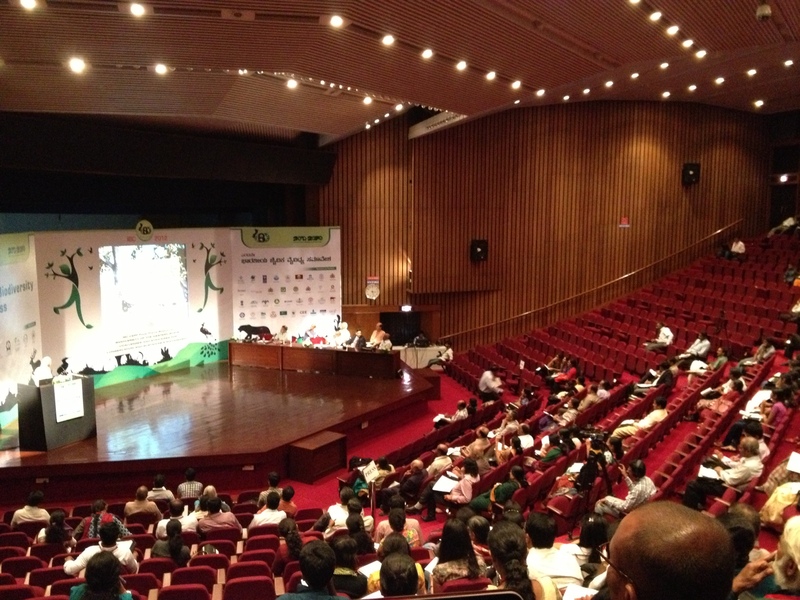 In this apparently important first plenary session, there were three talks: on Convention on Biological Diversity, on communicating biodiversity, and examples of community-based conservation across the country by Ashish Kothari. Madhav Gadgil had to (at times) be militant with the keeping of time and, what is often the problem at most of our conferences, keeping the questions on-topic. In spite, of Madhav Gadgil drawing a consensus that the three plenary presentations had the common thread of decentralization versus centralization, I could hardly perceive a coherence among the speakers, nor sufficient time for the audience to engage. However unhappy the organizers might have been with the subject of biodiversity and systematics, it could have been held during the day instead of the 10 PM starting time announced in the programme, unless, of course this was merely a typo. concentrated in protected areas. In spite of a lack of background, many of the abstracts were in fact about hardly known taxa such as mosses, soil invertebrates etc. Unfortunately, there was no schedule provided, nor was there a way of attending any of the over hundred studies being presented, especially because the plenaries ran right through! Some upcoming sessions tomorrow and day-after appear to be promising though. This one definitely on biodiversity, politics and conservation. Madhav Gadgil’s plenary talk was perhaps the highlight of the day.At one point, when he compared various hills and features of the Western Ghats to body parts and features of Draupadi (a beautiful maiden from the epic, Mahabharatha) quoting Kalidasa and Canto, there was some laughter at some points. An ecologist-friend wondered which part the Palaghat gap could be likened to. Albeit it was a powerful metaphor for anybody to relate to, when he likened the present development activities in various parts of the Western Ghats to the stripping of clothes off Draupadi. Otherwise, his presentation expectedly took us through the bitter-sweet reception to the Western Ghats Task Force Report, snippets of sacred groves, an instance of forest governance (or lack of it?) from Bhimashankar Wildlife Sanctuary where windmills have become a new threat(!). The task force report, a seminar hundreds of pages of meticulous work documenting threats to the ghats as well as making bold recommendations, has suffered from chronic government apathy and earlier suppression, which was overcome only through applicaiton of RTI. As he explains in his talk, misinformation about the recommendations continue. The Indian Bio-resource Information Network was unveiled by KN Ganeshiah. It was a promising presentation, which showed off this new web-based platform for knowing about various biota (plants for example) in a given grid-area. The data on several grids from the Western Ghats are apparently already available. I am not yet aware on how much crowdsourcing of data can/will happen (previous experiences with the India Biodiversity Portal although ambitious, were not very successful), but this seems to be a promising venture. But what really struck me was the total lack of defining a “scope” for the event. In the lack of it, the material presented seemed to be completely fall flat. There was hardly any participation by the forest department, nor was there sufficient publicity to draw lay public to the event. 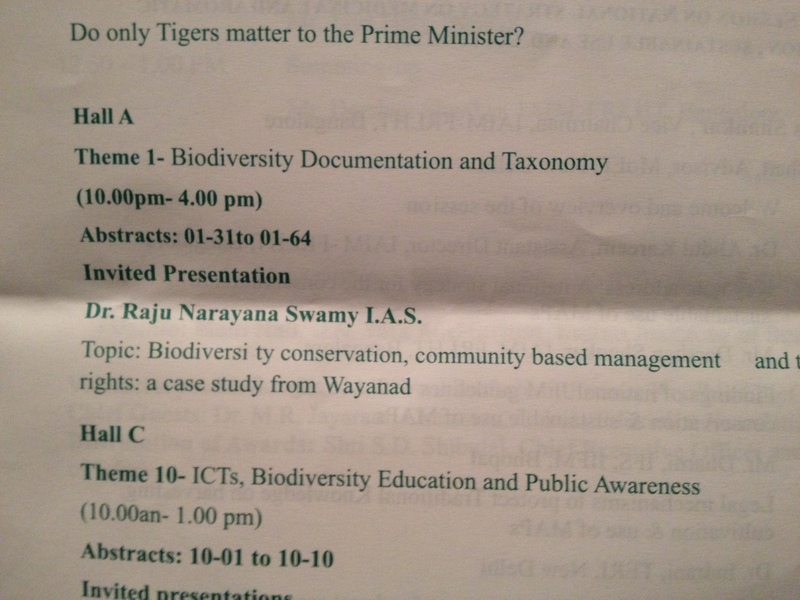 In my case, I happened to attend because a good friend was presenting on Western Ghats biodiversity. In fact, the presence of key departments including environment and forest ministries of various states, pollution control boards and perhaps even education departments in such events should have been perceived to be critical. It’s often the case that several such events where the interface with the government is crucial, there is hardly any effort to involve relevant government departments. I can understand with government departments are not involved in an organic chemistry symposium, but something that seeks to be a national-level congress on biodiversity? This entry was posted in Biology, Reviews, Wildlife and tagged indian biodiversity, Indian biodiversity congress, madhav gadgil. Bookmark the permalink. Thank you for your report which is depressing and thought-provoking. I had heard about this congress, and have been curious about it. Shame it is so poorly organized, but hopefully it is at least facilitating some good networking and communication among participants – esp all those students you mention. I hope you will be able to report on the rest of the congress as well! (Pasted from FB response) Thanks Madhu for dropping by. Well, I went in out of the blue actually. And frankly speaking, I have been a bit too severe on the event, picking too much through the poorly curated abstract book. It should otherwise serve all functions of any conference – networking etc. And no, I will not be going there for the next two days, not ONLY because of today though. And the typos are merely thanks to me not wanting to spend too much time later, deciding to do the whole thing as I sat on the last bench – so. Pondering your comment about a lot of the biodiversity in India being in protected areas – do we actually know that that is indeed the case? – I went and browsed through the ToC of the Book of Abstracts to which you have linked. 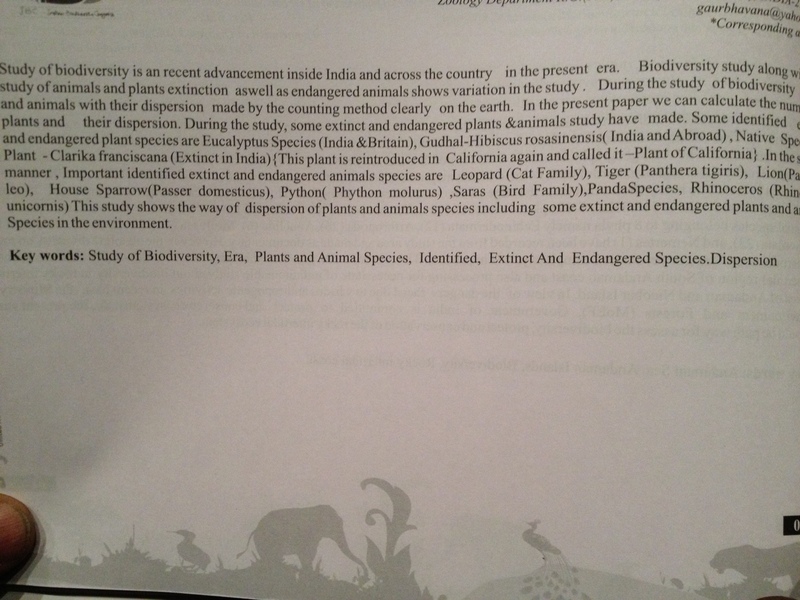 I was wondering if there were any presentations listed addressing biodiversity outside of PAs, and particularly, urban biodiversity which is my bailiwick. Doesn’t look like there is much from urban areas, at least based on the titles. Do you know if the full abstracts are online somewhere also? Or is it only in the print book? Thanks Prashant. I was a little disappointed that I couldn’t attend this but now I am happy to have a full report.